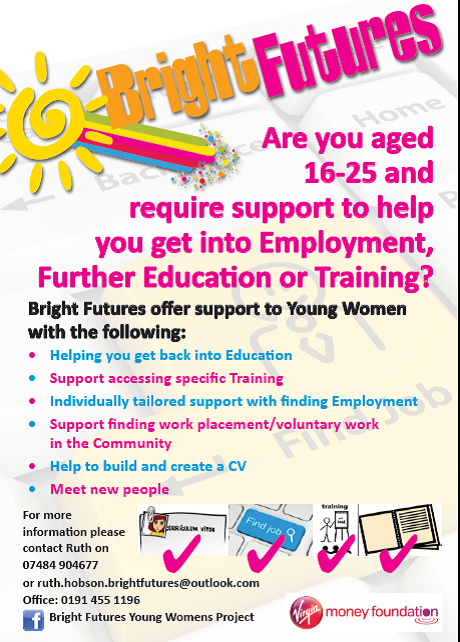 Bright Futures work with young women aged 16 to 25 who are unemployed offering them the chance to gain new skills, qualifications and career prospects whilst tackling some of the root cause of their disadvantage including offending, substance misuse, homelessness and domestic abuse. We focus on prevention and early education, overcoming problems to unemployment through recovery and independence, promoting employment as a route out of poverty, delivering support at a local level to young women to help them into employment, training and further education. Bright Futures have developed an informal project which has the flexibility to be adapted dependent upon the young woman that is being engaged with, we realise that all young women have different needs and therefore require a tailored project to meet their needs. Our employment projects are designed to cover several different areas in order to increase young women’s confidence and motivation to pursue education, employment and training.